With the circular saw unplugged, do a full safety check on it. Make sure that the blade is securely fastened by checking the bolt in the middle. You should also ensure that the safeties that will protect you are secure as well. Depending on how big the board is, you will want to set the blade so that it reaches an eighth of an inch below the wood when it’s up against it. If it’s lower than that you have an excellent chance that the saw will kickback, potentially causing injury. To move the guide, just loosen or tighten the adjuster as necessary. Make sure you have safety goggles on for any debris that will come up. After that, you are ready to plug in the circular saw and start working. 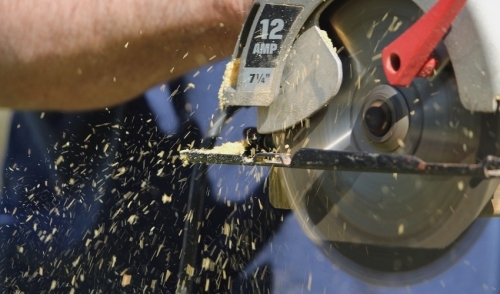 When you cut, make sure that you are not directly behind the saw but can still put pressure on it. Holding the trigger will activate the saw and you can begin to cut. Line it up with the mark you made and apply consistent pressure. If you feel anything go wrong, like the blade kicking back, release the trigger, hold the saw in place and let the blade come to a complete stop on its own.